I have gotten countless inquiries about my gear choices for the Appalachian Trial and my apologies again for not updating sooner. I’ve made a few changes from last summer on the CDT. My pack weight has actually increased a bit with some “luxury” items. On the AT, I will be carrying much less food and water than I needed to on the CDT, so figure I can afford a couple bonus items. I’m sure I’ll be rethinking that theory as I go up those steep climbs exhausted by heat and humidity! My final Base Pack Weight for the AT is 13lbs 0.4oz, which is 3.8oz heavier than I carried on the CDT. To see my detailed gear list broken down with weights and prices, you can click on my Gear/Reviews Tab. Here are the highlights of my updates and my thought process behind them. Many of you will remember my experiences with the ZPacks Hexamid Solo Plus. 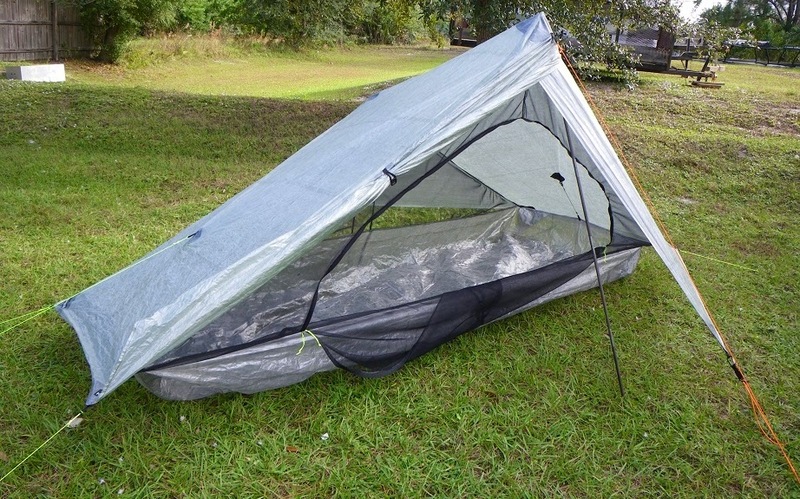 I found it to be a very strong tent and loved that the cuben fiber stayed taut with wind and moisture. My consistent complaint was how drafty it was and that it didn’t feel like a home at the end of the day. Well, this past fall ZPacks solved that problem when it came out with the new and AWESOME Solplex which has a sewn in bathtub floor and storm doors to provide full rain protection. It solves my issues with the draftiness and provides even more protection from the rain with the option to have exposure if I want. Plus, it is somehow 1.9oz lighter! These tents are not cheap and I didn’t even let myself look at it in detail as I could not reason getting another tent. Then the most amazing thing happened. A blog follower offered to gift me with a new Solplex! He wishes to remain unnamed, but I want to give a great big THANK YOU to this kind and thoughtful man for making me feel like a kid on Christmas. I am anxiously awaiting the arrival of the Solplex and now feel ready for those nights of rain along the Appalachian Trail. I’m sure I’ll be thanking you every night! I still can’t believe I’ll be sleeping in this tent. 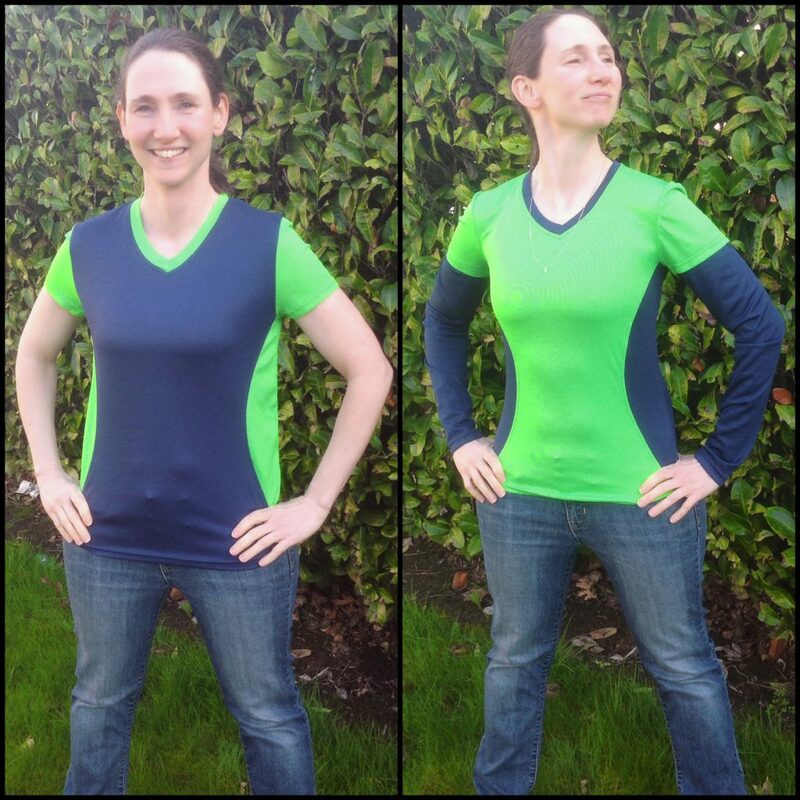 Customized tech shirts in my “wired” colors! seamstress combine them into one multi-colored shirt. THANKS Greenlayer! I found the wonderful seamstress Mimi from Mimi’s Alterations who combined the shirts to come up with what I’ll be wearing for 5 months. THANK YOU Mimi! I know that many people go onto the trail to get away from electronics and the internet, but I’m definitely NOT one of those people! Hey, we all have what makes us happy. For me, it’s being able to post regularly from the trail, talk or Skype with family/friends, and watch a show in my tent at night if I get the time and battery life. I really liked the Suntactics sCharger-5 solar panel (7oz) for the CDT, but the AT is known at the “green tunnel” and a solar charger will be useless. After much research, I decided on the NewTrent PowerPak+ with 13500 mAh (10.4oz), which I will call my “BRICK.” I reasoned this knowing that I won’t be carrying a GPS on the AT, so it was a wash in weight. 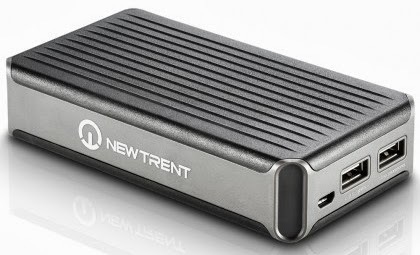 Most hikers who use NewTrent use their lighter Power Pak 11.0 (8.2oz). I chose the Power Pak+ for many reasons. I want the extra POWER because I know I’ll be getting lots of service along the AT with how close it is to towns. I love watching a show in my tent before bed, even for 10mins, and I hope this gives me the freedom to do that. You can see it has two USB ports so I can charge two devices at once and listen to my MP3 player all I want. A feature I really like is that it has a power indicator so I know how much charge is left in the battery and I’m not left guessing. Believe it or not, living in Portland, I’m just now getting my hiking umbrella. On the PCT and CDT, I had very little to worry about with precipitation. I am NOT looking forward to the rain on the AT. I have plenty of opportunity to test out rain gear in Portland, so I decided to test an umbrella on my long training hikes. It enhanced my enjoyment infinitely! 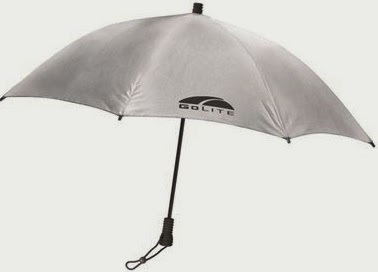 I decided to add the Chrome Dome Umbrella (8oz) to my gear list to start the AT. I’m considering it a luxury item and if I find it to be dead weight, I’ll send it back home. I’ve gone back and forth on this one. Do I buy a heavier rain jacket? Do I use my lighter down insulating jacket or my synthetic one that can get wet and be washed easily? The AT is going to be very wet, hot, and humid. But it could also snow randomly. I’ve heard that many hikers don’t even use their rain jacket most of the time because they are so hot they just go without it. I also worried about using my spiffy down jacket in such humidity and that it won’t be as insulating if I ruin the down by getting it wet. After talking with others who have done the AT, I’ve decided to keep my setup, which is the lightest option. My rain jacket is the same one I’ve used on all the trails, but I do replace it every trail. It is the OR Helium II (6.4oz). Yes, it is an OR infinity product good for a lifetime, but I don’t expect any rain jacket to last multiple thru hikes. I figure that with the umbrella I can get away with a lighter rain jacket. 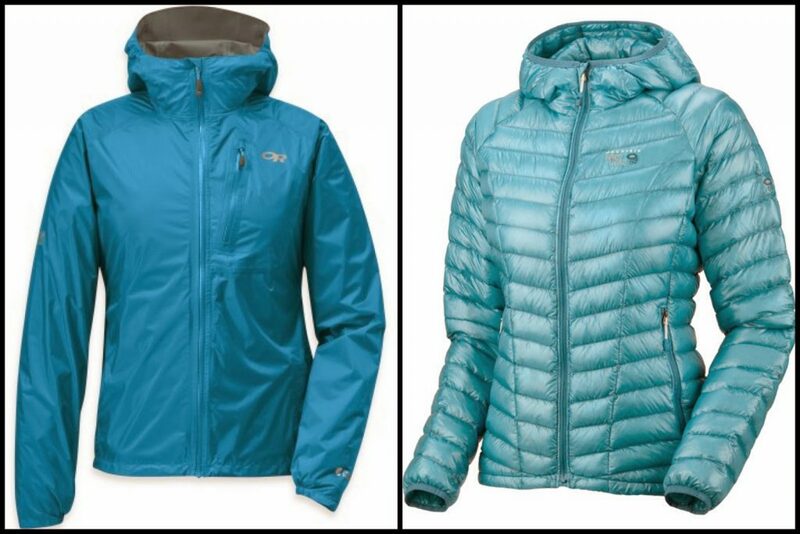 My down jacket is the super light and warm Mountain Hardware Ghost Whisperer (7oz). I don’t expect to use it a ton and will keep it safe and dry. So no changes here, but I contemplated it and will change on the trail if these options don’t work. I never really paid much attention to my hanging rope, but I rarely use it and hated the room it took up in my pack. While hiking with Bloodbath and Rampage last summer, I found out about the Dyneema Ironwire. It’s super light, thin, and strong. The only pain is that it can be tough on hands, but I was excited to update this small piece of gear. 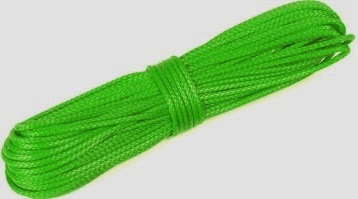 It is sold through ZPacks, but I was able to find it in my wired green color on another site. Score! Another thing I was envious over that Bloodbath and Rampage had on the CDT was the ZPacks Roll Top Blast Food Bag. 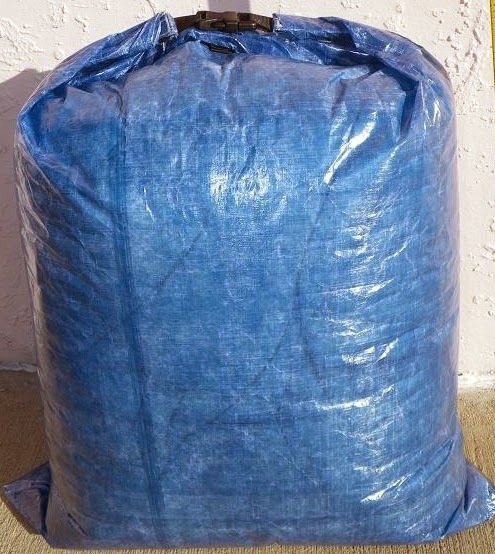 I was impressed with how durable it was and I like the shape of the bag. There are options to order it in two different shapes and I like the wider option so I can more easily get to things rather than having to dump out the whole bag. It is waterproof and I’ve read that people have had great results with it around mice. It isn’t rodent-proof, but very resistant.